Aaron L. Friedberg is professor of politics and international affairs at Princeton University, where he has taught since 1987, and co-director of the Woodrow Wilson School’s Center for International Security Studies. He is also a non-resident senior fellow at the German Marshall Fund of the United States and a senior advisor to the National Bureau of Asian Research. Friedberg is the author of The Weary Titan: Britain and the Experience of Relative Decline, 1895-1905 and In the Shadow of the Garrison State: America’s Anti-Statism and its Cold War Grand Strategy, both published by Princeton University Press, and co-editor (with Richard Ellings) of three volumes in the National Bureau of Asian Research’s annual “Strategic Asia” series. His third book, A Contest for Supremacy: China, America and the Struggle for Mastery in Asia, was published in 2011 by W.W. Norton and has been translated into Japanese, Chinese, and Korean. His most recent monograph, Beyond Air-Sea Battle: The Debate Over U.S. Military Strategy in Asia was published in May 2014 as part of the International Institute for Strategic Studies’ Adelphi Paper series. Brad Carson is a professor at the University of Virginia, where he teaches in the Batten School of Leadership and Public Policy. He served in the U.S. House of Representatives from 2001 to 2005 and was undersecretary of the Army and acting undersecretary of defense for personnel & readiness in the Obama administration. He welcomes comments at brad.carson@warontherocks.com. Brad: Professor Aaron Friedberg, you wrote now more than 20 years ago that China’s integration into the Western built system of open global commerce was supposed to promote its liberalization but, instead, the opposite might happen. How would you evaluate that writing now some decades hence with developments in China and the U.S.? Aaron: Well, I think the prediction of an intensifying rivalry or competition between the United States and China has unfortunately been borne out by events. So, the piece that I wrote that was in Commentary right around the turn of the century starts out by saying that it’s not only likely that such a competition would occur but that in fact, it’s already underway. So, I think there was ample evidence of it back then. So, I think in that sense, predictions have been borne out. The question of exactly why that’s happened and why it’s happened now and how it’s unfolded are complicated and some things that have happened, I don’t think anyone fully anticipated, but overall, the sense that we were likely to wind up in an intensifying competition I think was apparent quite a while ago. Brad: Can I ask why that is? I think one of the interesting things we think about China policy is to ask if we had a different form of government in China or maybe a different leader of the Chinese Communist Party than Xi, who seems particularly assertive, that things might be different. I mean think counter-factually for a moment, if Chiang Kai-shek had prevailed in the Chinese Civil War, China might have developed into an economic powerhouse decades before it actually did. Would we expect it to be friendly with the U.S. in that circumstance or was it a matter of the fact that here you have a great country with an incredible history behind it, massive size, wealth and that they would challenge the United States irrespective of the form of government they had? Aaron: And the Graham Allison book, right. Aaron: So, I think there’s truth in that and some, maybe much of what we’ve seen unfolding between the United States and China over the last 20 years or so is a reflection of that dynamic — and by the way, I think that’s one of the reasons why when people say we didn’t expect this or we were wrong about our expectations or everyone was wrong, it’s simply not true. There were people who pointed this out. So, there’s the dynamics of power politics, but I think the ideological factor also is critically important and until very recently, it’s tended to be underplayed in the West. For a long time, people said China’s leaders are no longer Marxist. They’re sort of capitalists and therefore, there’s no basis for ideological rivalry between China and the West, between China and the United States. Well, they may not have been Marxist anymore, but they are still Leninist, meaning they believe in the dominance of the single party and they have no intention of relaxing that grip or giving up their control, and as a result, China’s leaders, going back to the end of the Cold War and even before, but especially since, have believed that the United States was fundamentally hostile to them, not because of what they did but because of who they are and was determined to bring about the transformation of their regime and to coax them or force them or lure them into a transformation to liberal democracy. So, there’s been an element of ideological suspicion and competition from the very beginning and I think that’s growing. Brad: Were they wrong to suspect that in your mind? Aaron: No, I don’t think they were. In fact, if you go back to the early 90s and really up through the end of that decade, the debates over most favorite nation status for China in 1993-94 and then China’s entry into the WTO, American political leaders were very blunt in saying that they expected that trade would lead to growth, that growth would lead to the emergence of a middle class, and, in the long run, the middle class in China, as has been true elsewhere in Europe and in Asia, would be the standard bearer of liberalizing political reform, and there are numerous quotes to that effect from George Bush and Bill Clinton and Barack Obama and so on. So, I don’t think the Chinese were wrong to fear that or to believe that. 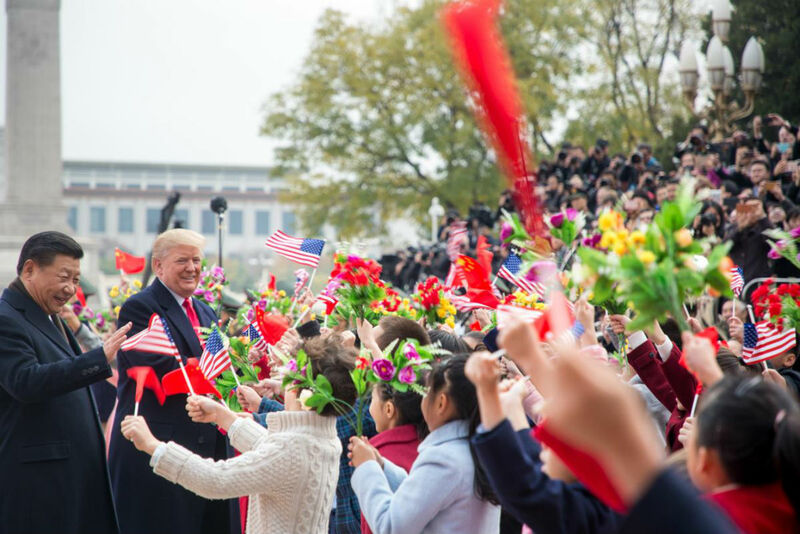 I think perhaps American leaders have moved away a bit from emphasizing that and talking about it but it was a theory that underpinned our economic engagement with China. Brad: That’s something academics develop. There was a notion in development economics that a middle class would demand certain political liberties and would change kind of things. How did China resist that? Because they’ve become wealthy in many parts of the country at least, but they seem to have resisted what’s happened elsewhere. How did we get it so wrong in that sense? Aaron: Well, I think the key to understanding what’s happened is the resilience and the resourcefulness and the ruthlessness of the Chinese Communist Party in its determination to maintain its exclusive grip on political power. After the Tiananmen Square Massacre in June 1989, the leadership … First of all, people in the leadership who might have been more favorably inclined towards some degree of political liberalization were purged. Brad: Zhao Ziyang and people like that. Aaron: Yes. On the other hand, the more conservative elements who didn’t like the economic reforms that Deng Xiaoping had begun a decade before also lost out. Economic reform would continue, but it would be accompanied by a package of policies and programs that the regime put into place that were intended to maintain its authority and control. One part of that was the notion that economic growth itself would buy the acquiescence if not the enthusiastic loyalty of the Chinese people, so reform and growth had to continue because that was one of the ways of maintaining control. Beginning in the early 90s, late 80s, and early 90s, the regime, which of course was always repressive, began to invest even more in the various elements and instruments of domestic security including the People’s Armed Police, a whole second army that’s devoted just to maintaining domestic control and then somewhat later, the great firewall, control of the internet, all of that, and then the last element, which I think was very important, was a deliberate effort to create a substitute for Marxist/Leninist/Maoist ideology, which the leadership realized had lost whatever appeal it might have, particularly to younger Chinese people and so the beginning of this patriotic education and the emphasis on a particular account of Chinese history that emphasizes the so-called Century of Humiliation, all the bad things that were done by foreigners to China and the key role of the Chinese Communist Party in restoring national dignity and protecting the interests of the nation. So they implemented a set of policies that were intended to maintain their grip, and they’ve invested enormous resources in all the various elements of that program and it has been successful up to this point. Brad: One of the things I’m struck by having interviewed a lot of China scholars over the course of the podcast that surprised me was how, in general, people are bearish, actually, about China. I think in the popular culture or if you’re in national security circles, China looks like it could be a major rival to the U.S. for decades to come, even surpass us. I’ve been talking to lots of experts. Many of them are very skeptical about China’s ability to transition, to get past what [inaudible 00:09:31], others have called the middle income trap that this neo-authoritarianism that Xi Jinping is imposing is not sustainable over time and, as a result, I leave these conversations often thinking to myself a strategy of a way to get out a little bit, containing it, waiting it out and that we will prevail in the end over this. Do you share that negative assessment of China? Aaron: Well, first, let me say, I think if you go back about 10 years or so, many of the people who now express these bearish views, were very bullish on China and there are some who still are. It’s gonna keep on growing, in part this reflected a belief that China would continue to liberalize and make greater … Have greater reliance on market mechanisms. So, the pessimism about China on the part of people who are primarily focused on its economy is relatively recent and it’s, of course, a reflection of real developments, the slow down in growth and the greater recognition of some of the obstacles that China faces in getting over the so-called middle income trap, the aging of the population, the burden on the economy that’s a product of decades of previous policies, one child policy and the failure to control environmental pollution and so on. Do I share that view? I think, in the long run, they are going to encounter serious obstacles to sustained growth. They are starting to now. Some of what they’re doing, especially the things that have aroused the most anxiety, not only in the U.S. but in other advanced industrial countries, particularly the theft of technology and attempts to acquire it through various means, including direct investment, is driven more actually by a desire on the part of China’s leaders and planners to sustain growth, to get over this gap to overcome the limitations that they realize are going to be imposed by the beginning of the shrinking of working-age population, their loss of advantages of low cost producer and so on, and we don’t know yet whether they’re gonna succeed in that. I think in the long run, there are fundamental tensions between authoritarian politics and market economics, but that’s been true for a long time and they’ve managed to sustain growth and to sustain authoritarian rule for quite some time and I’m afraid that they could continue to do it for quite some time, decades. Can they do it forever? I tend to think not. I think there are a lot of, as the communist theorists might say, contradictions in that system that will be very difficult for them to overcome, and some of the things they’re doing now could make those even worse and may make the crisis come sooner rather than later but I wouldn’t want to bet on it happening any time soon and, therefore, although I do think we have to factor into our thinking as we try to modify our strategy to cope with what we face now, I do think we would be unwise to simply count on that working in our favor any time soon. Brad: One of the things I think is interesting for people who are concerned about China is what’s really driving American policy. On one hand, you do have these intellectual views. You’ve talked about it from developmental economics, a market economy will bring with it a more pacific China. They will develop into a democracy, maybe even democracies don’t fight each other so — some of these democratic peace ideas find their way into the discussion like that. How much of it’s driven, though, by the need to make money? One of the things you’ve written about, and you have a great article about this, how in many ways, we’ve armed China. In the 70s, the 80s, the 90s, Democrat and Republican presidents alike were arming, selling dual-use technologies or even exclusively military technologies until Tiananmen that they had built upon to create a perhaps rival to us. Aaron: Yes, well, you mentioned something which made me realize that perhaps I had not fully answered your previous question about whether we would have the same problem with a democratic China, so maybe we could come back to that because I think it really is an interesting and important one, but there’s no doubt that particularly from the mid to late 70s up through the late 1980s, the United States very deliberately did things to promote China’s economic, technological and, up to a point, its military development. We never sold or transferred to them large military systems but dual-use technology, we helped them in various ways to improve the capabilities of their military and we did that, of course, because we saw them as an ally in the latter stages of the Cold War with the Soviet Union. That was constrained and constricted after Tiananmen and through the 1990s and of course, we’re not doing those things deliberately now, but at the same time, of course, we have this expanding, exploding economic relationship including transfer of technology in the commercial domain, which has also had strategic implications. One of the things that I think is problematic about some of the current rhetoric about China is that there’s a tendency on the part of people in this administration to say the Chinese have robbed and stolen and cheated and so on, all of which is true, but it’s also true that foreign businesses, including first and foremost, American companies, American financial firms, and so on, have profited enormously from their activities in China, particularly using China as a platform for manufacturing, so we were wholeheartedly doing a bunch of things that were supposed to solve our strategic problems in the long run because growth wouldn’t lead to political transformation but along the way, made large sums of money for some number of powerful and influential groups and individuals in American society and other Western societies. So, it’s not like we didn’t benefit or some people benefited from this relationship and it certainly made them … Made it possible for China to grow more rapidly. One thing that’s interesting, in a number of critiques by Chinese intellectuals including the artist, Ai Weiwei, had an interesting statement a week or so ago, basically, essentially what I’ve just said, that people in the West are angry and worried about China, but they need to look at themselves and at their own policies and their own responsibility for promoting the growth of what we see now as this powerful and potentially threatening Chinese force. Brad: Well, that does seem to be problem in U.S. politics in that what we might need from a national security perspective is very different than what we might need from an economic perspective, from a shareholder perspective, even from a consumer perspective as we benefit still from low-cost Chinese goods. Do you see those two as in conflict and perhaps the latter hurting the former? When we should be emphasizing national security concerns, we’re worried about these economic issues. Aaron: Well, we lived in a world in which we imagined that those things coincided. So, we did well by doing good, or we did good by doing well. We benefited economically, supposedly, and we also were, again, solving our strategic problems. Now, I think we see increasingly that there’s a tension between the economic and the strategic and also, of course, there’s a recognition now that there were costs, economic costs to the relationship that were greater than were acknowledged and understood at the time, and there may be even more going forward if we don’t adjust our policies. So, there is that tension. I think in the long run, and I should say, the fact that there were people, groups, sectors who benefited so much from this economic engagement, played a major role in shaping and sustaining a policy of engagement towards China and that was really, as many have said, that was sort of the ballast in the relationship. Anytime there were problems, you could count on various individuals, groups, corporations expressing their view, lobbying very hard to maintain good relations with China. That started to breakdown for various reasons, but I think as was true in earlier periods of our history when there were national security threats, our government has the authority, there are laws that exist or new laws that could be written to intervene in the economy for reasons of national security. We do it. We’ve done it. We did more of it during the Cold War. We’re starting to do more of it now to protect a national interest as compared to just the interests of individual companies. Brad: Let me ask two questions about that. One is what we could do and then how effective it is? I ask that because it does seem, with the ZTE example, that we have a lot of leverage over China. We basically put that company into receivership if you will until we backed off of it. At the same time, China has a hard time making integrated circuits, so all this AI that we worry about is fed by Nvidia and AMD and Intel chips that we make and sell to them, and so it seems as if we would have an incredible amount of leverage on their economy. Do you agree with that that we do have that kind of leverage and then, if we do, how should we be using that leverage to get better policy outcomes for us? Aaron: Well, I think we do have leverage in some areas and some sectors. You mentioned semiconductors. At the very high end, so the most sophisticated and capable and most important semiconductors for phones and computers and so on are designed and built by a handful of non-Chinese companies, American, Taiwanese, South Korean, Japanese, and as the ZTE case indicated, I think to the surprise of many people, probably both in the West and in China, that dependence at least of that very large company on American suppliers was extraordinary and to suggest would have put them out of business, and that probably will be maintained for a while, that’s one of the areas where China is trying very hard to close the gap and move up the ladder and get to a point where it’s no longer dependent on imports of the most sophisticated semi-conductors. Many of the cases that have started to come to light, including commercial espionage cases — one that was recently brought involved high technologies where this is the case, where there is a gap — appears to be true in the manufacture of jet engines, for example, so this recent case of Chinese businessman who was arrested and extradited to the United States was directed at getting information about engines. So there are a number of areas, but China’s also moving up the ladder across the board and getting better and better. I think we do have leverage for the time being, and I think we should use it and we should also protect our advantages. So, those are two slightly different things. We should try to use it to induce China to behave better and to adhere to the agreements that it signed as membership in the WTO, not to violate our laws and steal from our companies if we can and threaten to cut that off if they don’t. But regardless of what happens on that side, regardless of whether they do or don’t change their policies, I think there are strategic reasons why we have to do more to defend our advantages where we have them and maintain a lead where we can. We have to, of course, do more ourselves to make sure that our economy is innovative and flexible and developing and so on, but we also have to slow the transfer of some of those critical technologies, especially through illicit means to China because China is not a normal trading partner of the United States, even though we’ve tried to treat it as one. It’s a strategic competitor and we have to treat it differently than we would another country that didn’t have aims that we think are contrary to ours. Brad: How would you do that specifically, and maybe we can start with what the Trump administration’s doing? How would you assess what they are doing? Is it hurting China? Do they care about these kinds of things and if you would do something differently? If you were an advisor to President Trump, what would you tell him to do? Aaron: Well, I think, broadly speaking, we can divide what the current administration is doing into two categories. On one hand, they have imposed tariffs for a variety of reasons and they’re trying to use those for leverage to try to compel the Chinese to change their behavior. I’m gonna come back to that. On the other, they’ve started to take a number of defensive measures along the lines that we were just discussing — and this didn’t begin with the current administration. Some of these things have been in the works for a while. For example, the mechanisms for screening foreign direct investment in the United States. That actually was an initiative to strengthen those and, in particular, to make them more capable of dealing with a country like China with a lot of resources. Brad: The CFIUS processes, they call them. Aaron: CFIUS and now FIRRMA. And that started in the congress. The administration was very favorable. Changes in the export control regulations that will allow the government to restrict the ability of American companies to transfer or sell advanced technologies to Chinese counterparts, even where those technologies are not clearly military. That too is a kind of tightening up. These espionage cases that I mentioned a minute ago and enforcement, tougher enforcement of U.S. laws against theft of intellectual property and cyber intrusions and so on, all part of that defensive strengthening. I think that’s … I don’t know too many people who would disagree with that. Those things were controversial initially, but I think the obstacles to them have weakened and the objections to them have weakened as people have become more aware of what the Chinese actually have been doing. So, that part of the program, I think, is gonna continue. We will probably be working in collaboration with allied partner countries that have similar concerns about Chinese intrusion into their economies, theft or foreign direct investment that targets key technologies — and that’s already underway. The Huawei story is a piece of that. It’s not a new institution but it’s the implementation of an effort led by the United States to persuade other countries of the risks to letting this particular Chinese company build large portions of their IT infrastructure. So, I think all of that is gonna continue. Where it’s not clear yet where things are going, but there could be tighter restrictions on Chinese students, on cooperation between companies or labs. I think the National Laboratories last week issued new restrictions on their employees participating in some Chinese programs that had been used to try to attract talent in key technological areas back to China. So, we’re probably gonna see some tightening there as well. The tariffs and the use of the tariffs to try to persuade China to change its ways I think are a more controversial and maybe questionable and uncertain part of administration policy but they’re only part of it. Brad: Well, you’ve written that you can see possible three outcomes of what the administration’s doing. One is that China learns the lessons and opens up it’s economy like we would like to see it do. The second is that they remain closed and we continue to sanction and relations get increasingly adversarial, and the third is that the president accepts some kind of symbolic response from the Chinese. It does seem to be in some ways, at least looking at ZTE, that that third option might actually be the most likely one. Do you see it differently than that? Aaron: Well, it could be a combination of the second and the third. I don’t think it’s gonna be the first. In other words, I don’t think the Chinese are gonna say, “yeah, you got us, and we’re gonna fundamentally alter our system of industrial policy and technological development and so on.” That is not gonna happen. I think it’s, although I was a little concerned about this a few months ago, I don’t think the administration is simply gonna settle for nothing or empty gestures like promises to buy more soy beans. So, it’s gonna be somewhere in between. I think there probably will be some kind of agreements where perhaps the United States simply doesn’t increase tariffs, and the Chinese promise to make certain changes, for example, improving the ability of American companies to operate inside China, but even if that happens, I think this process of disentanglement or disengagement is gonna go forward, not towards a total Cold War complete separation, but we see it already happening in the high technology domain. There is gonna be an increasing separation between the two, and both are taking protective measures — and by the way, this was something that the Chinese started with laws, cyber security laws and restrictions on Western companies operating inside China, for their own reasons, and we are probably gonna respond in kind, indeed, we’ve already started. I think the question is how far that’ll go and how fast it will unravel. If the relationship were to really spiral down, if there were to be some kind of confrontation, and we were to slip into something that really more closely resembled the Cold War, then I think we could see a real break in economic relations between the United States and China. Short of that, I think it will be constrained in various ways. I think it’s also possible that we’re moving towards a world of economic blocs where the Chinese try to build up a block in Eurasia with them at the center and keep out the United States to some degree, and the United States does something similar in the western hemisphere and, maybe, in cooperation with European countries, that has yet to be determined, and it may be more difficult to do that because of Trump administration policies towards those other countries, towards those allies and traditional trading partners of the U.S., but I think we may wind up moving in that direction, and I think the Chinese have kind of expected that for a while. They were happy to have this access, and they needed this access to the United States to advanced industrial countries for their exports for technology and so on, but I don’t think they believed that it was gonna last forever, and they’ve been trying to do things to prepare for a world in which perhaps it was not so easy for them to have that kind of access, including increasing their own autonomy in high technology and also developing markets elsewhere like in the emerging countries. Brad: Is there a sense from your perspective that we’ve been made to play the fool in this relationship with China? And I ask that because you go back 25 years ago now and you’d find writers like John Mearsheimer saying, from a purely hardheaded standpoint, the goal of the United States should be to avoid the enrichment of China at all costs. Keeping it relatively poor is good national security for us, even if it’s not the most humanitarian or the best for everyone on the planet to do that. We basically have made them rich it seems like, the U.S. market, the technology transfer both licit and illicit has played a huge role in the development of China, especially when coupled with this philosophical idea that seems to be increasingly in doubt that this development would lead to political liberalization. Was Mearsheimer right 25 years ago when he said that? Aaron: Well, I don’t think it was necessarily inevitable that it would’ve played out in this way. I mean my view of the policies that we’ve been pursuing were a gamble, and we chose to pursue a path that could have had a better outcome. It didn’t. The problem I have is not so much that we started down that path but that for various reasons, we weren’t careful enough in monitoring what was happening and protecting ourselves as it became clearer and clearer that it wasn’t working out. So, I think it’s Bismarck said at some point, we shouldn’t commit suicide for fear of death. Well, to have assumed at the beginning that this was inevitably going to unfold the way it did would have increased the likelihood that it did in fact turn out that way, so I don’t have a problem with the fact that we tried to engage China in this way, but I think we’ve been asleep at the switch for too long. It’s taken too long to acknowledge what’s happened and to defend ourselves. I think we’re finally at that point. Brad: And what do you think it is that China, if left unmolested, really wants from the world? ‘Cause there are people like Lyle Goldstein at the Naval War College, David Chang out in California who see China as a rising but fundamentally benign actor. Indeed, Lyle Goldstein said on this podcast, “You know, the U.S. has been at war for 30 years straight. China’s not been at war since 1979. So, which of these countries is more revisionist.” So, left to their own devices, what does China want? Aaron: Well, I think China’s leaders, Communist Party leaders, want three things broadly. One is to preserve the monopoly of the Chinese Communist Party. They want to rule forever. They don’t want a new dynasty. They want to make sure this is the last dynasty and that, I think, drives everything that they do domestically and in foreign, in defense policy, but that also makes them behave, as they become more powerful, in rather aggressive ways because they feel threatened by the existence of U.S. alliances or the presence of democratic countries around their periphery, so they’re a revisionist power in part because they now have the capacity to push out in order to defend themselves as they see it and defend their regime. That’s number one. Number two, closely related, I do think that they see China’s rightful role as being the preponderant power in eastern Eurasia and they think that that’s historically what’s been the case. They see the United States as the only challenger to that position, and they regard the U.S. as an interloper. We’re not really an Asian power. We’re there because of the Second World War and because of these so-called unequal treaties as they see it with Korea and with Japan that enable us to maintain military capabilities there, and they think that should come to an end and naturally, when that does, they will be the dominant power. Now, what that would look like I think is open to question, but I don’t think it would be a friendly world for American interests, for our friends, for the future spread of democracy, for open markets, for freedom of navigation, I think all of those things would be at risk if we allowed China simply to dominate eastern Eurasia. The last, third, which I think is emerging and perhaps isn’t yet fully evident but I do think that China’s rulers believe that in any international system, there is likely to be a single hegemon. There’s one preponderant power, and it has been the United States whether it’s since the end of the Cold War or since the end of World War II or whenever you want to date it, but they’ve had to live in this world in which the United States was dominant, and they don’t want to live in that world any longer than they have to. I don’t think they would believe that it’s possible simply to cooperate and get along. I think, in the long run, they believe that they should be the world’s preponderant power and displace the United States, but I think they are realistic enough to acknowledge that if it happens, that’s somewhere in the distance, but they’re thinking about it and talking about it, I think, more than would have been the case a few years ago, but regional preponderance certainly. Brad: Well, some people will say if the U.S. were to pull out of Asia, that you have a lot of powerful countries that border China, Japan, India, Vietnam, Indonesia, the Philippines, and others like that, that they themselves will step up. These are countries that are quite mighty, especially if they aspire to a greater defense role. So, why not leave it to those countries to do the job? Aaron: Well, I think to some extent, we have to rely on the desire of those countries to maintain their autonomy and to defend their interests and we have to work with them particularly as their concerns about the implications of China’s growing power take hold, as I think is starting to happen, certainly has happened in Japan and India to a degree to, but we can’t rely on that. Historically, balances of power do tend to form, but they don’t form automatically, and that’s why we have wars. Moreover, for a country like China sitting in this kind of central position, the opportunities to divide, to play one off against the other are considerable, and from a purely military point of view, the fact that Japan has a large GDP, or that South Korea is wealthy, or that India is a growing country, that doesn’t translate into a meaningful effective military alliance that it’s taken decades for us actually to get something that resembles a closely knit coordinated military alliance with Japan. So, the prospect that these countries could effectively cooperate and maintain a favorable balance of power even as China grew without the United States I think is … It’s wishful thinking. Brad: I’m gonna ask you a number of short-answer kind of questions about kind of whether you would favor this policy or not because one of the things I’ve struggled with following this issue is lots of people are concerned about China, but fewer people have specific policy recommendations about what to do. So, I’d like to ask some of those kind of questions to you. And one of the things that people have talked about is sanctioning any company in China that’s benefited from forced tech transfer or stolen IP. Do you think that’s a good idea? Aaron: I think if we could establish it in a satisfactory way, I would not be opposed to that. I don’t think you necessarily want to do it as a blanket measure, but, sure, why should we simply look the other way if Chinese companies have profited and benefited from the theft of intellectual property. Brad: One of the other ideas I’ve heard is sanctioning state-owned enterprises or other Chinese companies that have been involved constructing the artificial islands in the South China Sea as a response to that. Aaron: Well, I don’t know that it would be very effective in undoing what’s been done but it could conceivably be a deterrent against other similar kinds of activities and since we don’t have a wide range of options for responding to some of this creeping assertiveness or aggression, I’d certainly be willing to consider it. Brad: How about expanding CFIUS to cover say Chinese media purchases and being more worried. We talked to Larry Diamond on the podcast a couple of weeks ago, very worried about how the immigrant population in the U.S., the Chinese language newspapers here have been bought up by pro-mainland China people and trying to find some way to either have nonprofits support alternative news outlets or to prohibit those kind of transactions to begin with. Aaron: Again, I think we’ve overlooked or ignored activities which are contrary to our interests. That’s one of them. We’ve also allowed Chinese media organizations to operate … Chinese state-owned media, to operate in ways that allowed them free access to all elements of our society when our corresponding media companies are not allowed similar access in China. I don’t think we want to do in this country what the Chinese do there but we need to reexamine all of those policies. I mean the key to a lot of this is to recognize first of all that many of the entities and individuals that we’re dealing with have direct links to the state or the party-state, and if they don’t have direct links, they have indirect links and are at the beck and call of the authorities in China, so we can’t afford to treat them as if they’re just another company or it’s just another foundation or it’s just another wealthy individual. We have to ask who’s business are they doing in the United States. Unfortunately, we’ve reached a point where it’s necessary to be more vigilant. Brad: Do the Confucius Institutes at various colleges and universities concern you? Aaron: A bit. I don’t think they’re the biggest or most problematic aspect of this problem of political warfare, as the Chinese might call it, but yes, why should American universities, as many have done, enter into secret agreements with an organization that’s linked to the Chinese party-state that allows these organizations to operate on their campuses and not only to provide benign language instruction but to be involved in programming and, in some cases, trying to prevent speakers or conferences that touched on issues that would be considered sensitive back in Beijing. And I think we’re starting to see a lot of these being closed down because U.S. universities were, I think, somewhat naive or maybe a little bit greedy, the money was green, they didn’t want to say no, but I think there’s a growing recognition that that isn’t appropriate. Brad: How about cutting back on the number of Chinese students who study at U.S. universities? Aaron: I think there you’d have to be very careful. I don’t think, for example, that undergraduates coming to study in the U.S. for the most part ought to be a subject of concern. I think we still have to have some hope that some of those people would be influenced in ways that we would consider favorable by their exposure to American society. I do think we have to look at some areas of high technology and scientific cooperation and development that have strategic implications and think more carefully about what kinds of relationships are appropriate. In Australia, at least, it’s been revealed that there were quite a number of interactions between Australian universities and counterpart institutions back in China that were actually linked to the PLA, and there were professors at those institutions who didn’t reveal to their Australian colleagues that in fact they were colonels or majors or generals and were involved in research on technologies that pretty obviously have at least the potential of being used for military purposes and we have to be more cautious about that. But I don’t think you want to slam down the door and make it impossible for there to be people-to-people contacts and exchanges, particularly among younger people. Brad: Some people have proposed on the military side, security guarantees to countries like Vietnam, would that be advisable? Aaron: I think it depends on who we’re talking about and what the circumstances are. Security guarantees obviously mean, if you take them seriously, that you have to be prepared to fight and come to the assistance of those to whom you’ve extended a guarantee. We don’t extend such a guarantee to Taiwan. I mean we have an ambiguous promise to help them. I think we probably can accomplish many of the things we want to accomplish in strengthening a balance against China without extending those kinds of guarantees. Moreover, I suspect that most of the people in that region who are not clearly aligned with the United States through formal alliances would not want overt security guarantees because of their concerns about the response from China. So, I think there’s a lot we can do with Vietnam to strengthen its ability to patrol its waters and airspace and so on, defend its interests, without extending a formal security guarantee. Brad: And how about Taiwan? This ambiguity you mentioned, is that a good thing for us? One some people talk about making a more open support, perhaps independence of Taiwan. So, both the question of independence for Taiwan and also arms sales to the island. Aaron: Well, of course, we do undertake arms sales and many U.S. administrations have done that. I think that’s appropriate. The Trump administration, I think, has tried to make that process more routine and not have a single big package that then gets debated and to which the Chinese respond but to do things in pieces and that makes sense. I think at the political level, we do have to make clear our commitment to Taiwan and we’re required or administrations are required by law by the Taiwan relations act to promise to come to the aid of Taiwan if they’re the victims of attack or coercion, unprovoked attack or coercion, and we need to signal clearly to the Chinese that we mean that. The most worrisome thing to me would be a situation in which they became increasingly doubtful that we would actually follow through on those commitments and so some of the seemingly small gestures that we make that antagonize the Chinese and make them upset and cause them to come and march in our diplomats and so on are serving their purpose by indicating our willingness to accept that degree of tension to signal our continuing commitment to Taiwan. I don’t know anybody who thinks it would be prudent at this point to advocate Taiwan independence or to support Taiwan’s independence and, of course, most people in Taiwan don’t want that because they know that it’s likely to provoke a forceful Chinese response, so there’s plenty we can do to signal our commitment, to strengthen Taiwan’s ability to defend itself without going so far as to overtly provoke China. Brad: On some of the territorial disputes in the East China Sea, the South China Sea, the U.S. has been studiously neutral between the actors. Some people have said that perhaps we should intervene there and take the side of the countries contesting China for these. Do you think that would be wise? Aaron: Again, it would depend on the particulars, but in some instances, for example, in the Philippines, if the Chinese were pushing harder to extend their control over contested waters or land features, that’s an option that we ought to consider. We might indicate that we would do that if they were to continue with the policies that they were pursuing. This position of studious neutrality, I think, was originally based on the idea that somehow these disputes or disagreements about control would be resolved through some mechanism of peaceful discussion and negotiation adjudication. The Chinese have shown little interest in that. In fact, they’ve rejected rulings by international tribunals questioning their activities in the South China Sea, and if they continue to push in that direction, we probably have to contemplate doing things that again, signal more clearly our support for other countries defending their own interests but with all of these things, you have to be able to back it up. You don’t simply want to be making gestures that make you feel good but then encourage the Chinese to challenge or test your resolve. Brad: The artificial islands in the South China Sea seem like they’ve been particularly problematic for us. In many ways because we can’t think of the right response to it. There’s, of course, freedom of navigation operations, which had a mixed history in the Obama administration. What do you think we can do about those, that kind of construction project there, or maybe we shouldn’t do anything about it at all? Aaron: Well, I think one question to ask is what we could have done differently that might have dissuaded the Chinese from going as far as they did because I’m not convinced that they, from the beginning, were determined to do all the things that they eventually wound up doing and I think if we had shown greater resolve in resisting what they were doing, you mentioned sanctions against companies that were involved, findings measures that would impose some kind of costs on them early on, perhaps we could have curtailed that. We didn’t and we agonized endlessly over these freedom of navigation operations but, in the end, didn’t do anything effectively to prevent the Chinese from building out these islands and then fortifying them. And now we have this as a fait accompli, I don’t think anyone seriously believes we’re gonna roll this back. So, then the question is what to do about that and I think that has to be addressed at a number of levels. One, on a day-to-day basis, a routine basis, we simply, along with others, have to demonstrate our commitment to our interpretation and widely shared interpretation of what it means to have the right of freedom of navigation, and if the Chinese were to do something like declare air defense identification zones as they did over part of the East China Sea, our reaction should be similar to what it was in that case, which is simply to deny those things are meaningful and to fly right through them and to leave it to the Chinese to respond, which, of course, in that case, they didn’t. So, they’re trying to push out this fear of effective control, but, on a normal peacetime day-to-day basis, we can deny the reality of that simply by refusing to accept their interpretation and leaving the onus on them to escalate. I should say that’s also something in which it’s clear a wide assortment of countries have an interest and not just countries in the region but elsewhere, including in Europe. So, the French and the British have shown a willingness to sail in these waters, to engage in exercises of various kinds, so I think there’s a kind of multinational coalition that’s formed partly at our urging but partly organically to resist and oppose China’s efforts to establish its control. And that’s a good thing. If we’re concerned about crisis, conflict, or wartime, then we have to do things that would enable us to project and sustain our military forces in that part of the world more easily than we can do now because of the great distances involved. And so what would be desirable for that purpose would be to get greater access to facilities for ships, submarines, aircraft closer into those waters and for that purpose, the Philippines is probably the single most important. We’re doing things with Australia. Australia’s a long way away. We’re doing some things with Vietnam, for various reasons, there will be limits to that kind of cooperation. The Philippines is a treaty ally of the United States. Of course, for many years, we had bases and operated from those. If we’re serious about maintaining a strong military presence in a crisis or engaging in a conflict, we’re gonna have to have this capacity to sustain large forces over time. That’s what the Chinese have gained, I think, by building these islands. It’s enabled them to project their power and to sustain air and naval power at greater range from their own shores through the use of those bases and facilities. Brad: So, should we be trying to get Clark and Subic Bay back into the American base structure? Aaron: Well, I think there could be advantages to that. I think there were discussions ongoing a few years ago about something less dramatic than that, some smaller facilities on several of the Philippine islands and, as always, you’d have to look at the operational requirements. I don’t think we want or need something on that scale and, of course, as time goes on, targets and fixed bases further and further from China’s shores are vulnerable to Chinese missiles. I don’t know that we want to invest huge sums of money in building things that could be relatively easily destroyed but there’s a lot we could do and in other waters as well in the South China Sea, we’re starting to do some of this with the Australians in response to concerns about China’s intentions in developing facilities in those areas as well. So, there’s a lot we can do. I don’t know that we need to rebuild Clark Airfield, which was an utterly massive facility, and Subic Bay as well. Brad: So, if you look forward 20 years, given current trends in the U.S., China, what do you think the relationship will be between the countries in a couple of decades? Aaron: Well, that’s the $64,000 question. I think it’s gonna depend a lot on what happens inside China. I think if China continues along the trajectory that it’s currently following, if the CCP remains in power, we’re going to have a very rocky road and we’re gonna continue to have a contentious relationship with them and this competition that’s now underway is going to intensify. There may be several variants of that scenario, and one, if China is able to resolve some of its economic problems and continues to grow at a healthy rate, it’ll become increasingly difficult to maintain a balance. On the other hand, if China sinks into this middle income trap and doesn’t grow at a healthy rate, the country may be poorer than it would otherwise be. It will be poorer. It might be somewhat less stable in certain respects but in part, for that reason, the foreign policies that the leadership pursues could be more aggressive. I think one of the reasons why, in the last 10 years, we’ve seen this tougher posture is both the growth of Chinese power and the concern of Chinese leaders about the need to mobilize nationalist sentiment, and they’ve chosen to do this in part, in addition to the patriotic education that we talked about earlier, by picking fights with foreign powers. They don’t want war but they need enemies. They need people to point to as the source of problems and the foes that the CCP is gonna oppose. The other big question there, of course, what we’ve … So, that’s what might happen in China is what happens in the United States, what happens in allied countries in the region and there are a lot of unknowns there. On the one hand, it’s possible that those balance of power dynamics will continue and will grow and that countries like Korea and Japan and others will intensify their efforts to balance Chinese power, cooperate more closely than they’re doing now to achieve that objective. But it’s also possible that someone or other of them may fall by the wayside, maybe sort of picked off and drawn into the Chinese orbit, isolating the others. And then, of course, there’s a question about us, about the United States and whether the American people are willing to sustain this effort, whether they have leadership that believes that it’s important to do so and can explain why it’s important and justify the kinds of expenditures and efforts and risks that will be necessary if in fact that’s what we decide we want to do. I wouldn’t have said a few years ago that that was very much in question but obviously it is now. Brad: We ask everyone who comes on Jaw-Jaw to recommend two or three books that people who are interested in this subject might go to as well. What would you recommend to listeners? Aaron: Well, I have two that are sort of obvious and on the topic but one that is not. The two that are obvious or on topic, Jim Mann’s book, The China Fantasy, which is 2007 and really put his finger on a number of things that have become more evident, so an important book that perhaps didn’t receive the attention that it deserved back then. A new book that I just read that many people don’t seem to have heard of but which I recommend is Stewart Paterson, China, Trade and Power. He’s in business, in finance in Hong Kong. This came out last year, 2018, but it’s a very good short account of the sources of our problems with China. The last, which isn’t on the China topic but resonates with me for reasons that I think may be obvious is a book by a historian named Lynn Olson called Troublesome Young Men. It was published in 2007, and this is a book about the young members of parliament and others around Churchill who, in the 30s, tried to alert their country to the danger posed by the rise of German power. And it’s a fascinating book aside from anything having to do with our current circumstances about a situation which may, in some respects, resemble ours. Brad: Terrific recommendations and let me ask a question of you as someone who studies this, for people who are interested in this question, do you think it’s more important that they read Alfred Thayer Mahan or Halford Mackinder and Nicholas Spykman to understand, perhaps, China’s grand strategy? Aaron: Well, I’m gonna kind of do the professorial thing here and say well, they must read both because both are relevant, especially for China. It’s traditionally a land power which is now trying to become a sea power and in China, of course, both of those authors are … Both sets of authors are read and have been translated and there’s a lot of debate about whether China can be a sea power as well as a land power, so I’m gonna fudge and say both.